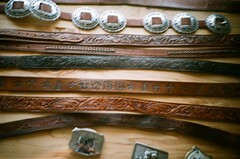 Creating your own designer belts to go with the garments you are designing for your fashion business makes good sense. If you are designing coats for instance, why not design belts to go with them. This would make the outfit you are going to eventually sell, highly unique. Again sweaters, tunics, trousers or jeans, all of these would look great with a choice of designer belts. Not only would you be supplying something very unique but by doing so, you could also be generating more revenue for your fashion business. Fashion accessories are often overlooked by a fashion designer entirely because they may not have the experience of producing such items. However, with research, a designer could so easily add many accessories to their range. The advantage of this would be that they would be opening up more opportunities for their success in the fashion business. Next time you think of designing a garment, consider also the impact of having designer belts to compliment your designs. Belts at the London Fashion Show were a prominent feature with many designers, some of which were beautifully inlaid with huge jewels. This entry was posted in Fashion Course Online Articles and tagged Business Fashion, Coats, Compliment, David Shilling, designer belts, Designer Fashion, designer hats, designing, fashion accessories, Fashion Belts, Fashion Business, Fashion Design, Fashion Designer, Fashion Report, Fashion Show, Free Fashion, Garment, Garments, Good Sense, Jeans, London fashion, Start Business, Sweaters, Trousers, Wablair. Bookmark the permalink.